Revolution is not a single event. Revolution is finding True North and walking toward it. The first four of these criteria speak to the ability to achieve both social benefit and financial viability. The fifth factor speaks to the importance of organizational learning and entrepreneurial adaptation. From the beginning of our work, Eric Carlson and I realized we had more to learn from social ventures embedded in diverse cultures with severe resource constraints than we had to teach. To illustrate the importance of humility and learning, I asked an award-winning documentary producer and colleague, Mike Whalen, to capture the experience of social entrepreneurs and their mentors in the 2006 GSBI cohort. 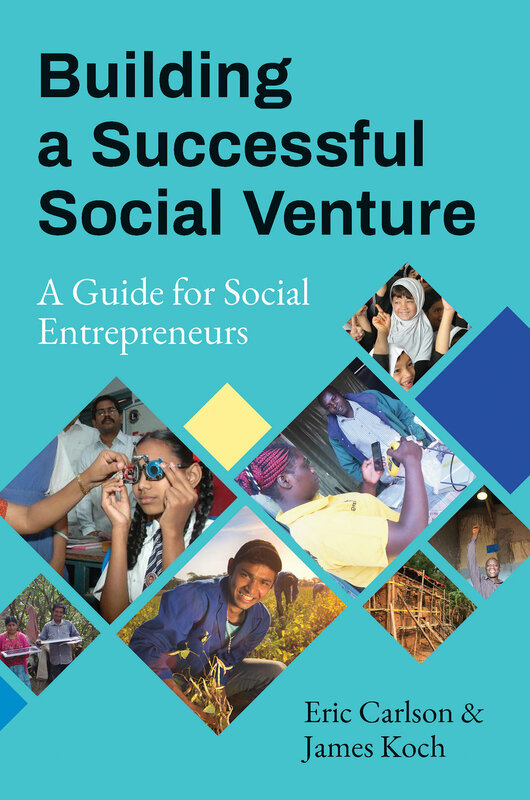 His short video, A Pedagogy of Accompaniment vividly illustrates how the lives of both social entrepreneurs and their mentors are transformed by the experience of collaborating to create a better world through the development of sustainable and scalable solutions for serving urgent unmet human needs. I shared this video with my academic colleagues at the USC conference and have been amazed by the many comments I’ve received from them about how this historic video evoked imagination about the “possibilities” for systems change and the potential for value-added scholarly work across the diverse cultures and many countries represented by conference attendees. In writing Building a Successful Social Venture—A Social Entrepreneur’s Guide, Eric and I sought to capture the informal knowledge of the more than 200 mentors who have worked with social entrepreneurs at Miller Center, with a particular focus on the roughly first 50+ individuals we vetted during the first decade of the GSBI program. These individuals were selected based on a variety of factors with a particular emphasis on C-level or senior management experience in Silicon Valley start-ups, general management or P and L experience, and/or acumen in marketing, finance, or operations and supply chain management. An additional “intangible” factor proved to be critical to the success or failure of GSBI mentors—the ability to listen with humility in order to understand how their knowledge could be bridged to efforts to serve unmet needs at the base of the economic pyramid. There is an important distinction between explicit (formal) knowledge—the kind possessed by scholars attending the 15th Annual Social Entrepreneurship Conference—and the implicit (informal) knowledge of successful entrepreneurs. Mentors in the GSBI rely primarily on implicit knowledge. The learning organization emphasis in Miller Center required that this knowledge—honed in the munificent environment of Silicon Valley—be adapted to the specific characteristics of markets in poor communities, including local culture and environmental constraints. Similarly, it required mentors to bridge technology knowledge rooted in the Silicon Valley to the available appropriate technologies and management capabilities within cultural parameters. In Building a Successful Social Venture (BSSV) we codify the accumulated implicit knowledge of GSBI mentors over more than a decade in the form of explicit or basic knowledge needed to complete each element in the 9-factor social venture business planning process summarized in the figure below. 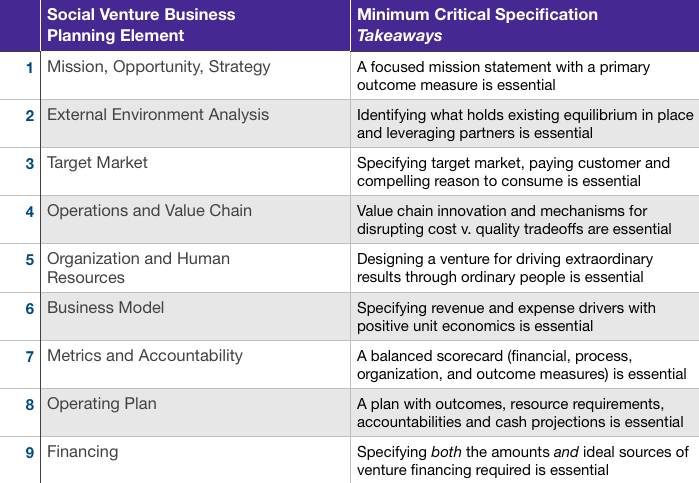 For each of the elements, BSSV also taps the collective intelligence of mentors in the form of a “Minimum Critical Specifications Checklist” for what needs to be included in that element of the business plan. In systems thinking, a minimum critical specification is a condition that is critical to the overall viability of system design. For social ventures this translates to the ability to achieve both social impact and financial goals. For example, in element 1—Mission, Opportunity, and Strategy—the collective intelligence of Silicon Valley mentors from their work with hundreds of ventures posits that a focused (10-word) mission statement with a specific outcome measure will increase capital efficiency and the likelihood of venture success. The negative aspect states that no more should be specified (in structure, formal systems, and bureaucratic rules) than is absolutely necessary. The positive aspect states that we need to identify what is essential. In writing Building a Successful Social Venture—A Guide for Social Entrepreneurs, Eric Carlson and I have sought to do just this—to clarify what is essential¸ while respecting and continuing to learn from the work of social entrepreneurs who seek to rewire our systems, our practices, and our mindsets. Our framework intends to contribute to the gradual elaboration of a new model of socio-economic development—one that is better fit for two thirds of humankind at the base of the pyramid than current approaches to economic development. We hope that Building a Successful Social Venture, based on Miller Center’s framework, will help thousands of social entrepreneurs. Here’s to a future filled with hope! James Koch is Professor of Organizational Analysis and Management Emeritus and former dean of the Leavey School of Business at Santa Clara University, where he also served as acting dean of the School of Engineering. He is the founder of Miller Center for Social Entrepreneurship (previously the Center for Science, Technology, and Society), co-founder of the Tech Awards—Technology Benefiting Humanity, and of the Global Social Benefit Incubator. In addition to entrepreneurship and social innovation, his research and consulting focus on organizational change and the design of high-performance work systems. Prior to coming to Santa Clara University, he was director of Organization Planning and Development at PG&E, a recipient of the American Society for Training and Development Award for Excellence in the Organization Development Professional Practice Area. He began his academic career at the University of Oregon where he was associate dean of the MBA and PhD programs before leaving to join PG&E. Jim has served on a number of for-profit and nonprofit boards, including Commonwealth Club of Silicon Valley and the Board of Trustees of Bay Area Council Economic Institute. He received his MBA and PhD in Industrial Relations from UCLA.